Do we collect videogames and their assorted memorabilia objects for authenticity or for convenience? Is it more enjoyable to sit down in a dedicated area, with original or fully-optimized hardware, and play a game like we might have in our youth? Does digitization ruin any artificial abstraction of us pretending to be back in our carefree youth? Or can we reach for a file, legally acquired, of course, and enjoy that game the same way? I’m more in favor of authenticity, but not by much. During this packing process, I had a certain satisfaction in popping in my cheaply-acquired copy of Fire ‘n Ice and playing for a bit. That was, subconsciously, the game that was going to dictate where my collection would go. If it was terrible, I’d sell it and a majority of the collection for a decent profit. Since it wasn’t, I ended up only sorting out the duplicates in this round, which will still help me break even on my investments made 10+ years ago. Seemingly insignificant, sifting out the dupes is important. As a hoarder with a fierce hoarding mentality, at the height of my hoarding irresponsibility, I’d buy anything that caught my fancy, regardless of whether I needed it – in either the sense of the object adding value to my life or filling a gap within any of my collections. 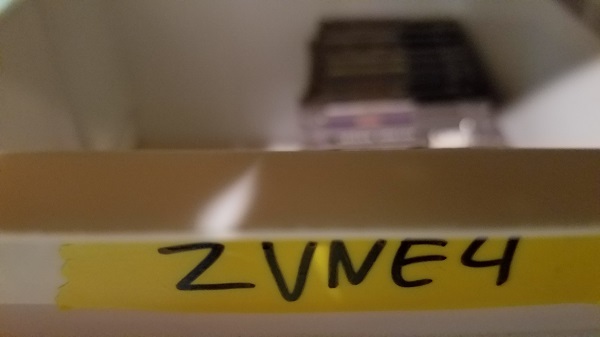 To painlessly fit my collection into four boxes, labeled “ZVNE1” through “ZVNE4” (Zeal, Videogames, NES, box 1), means that I’ve accepted the certain degree of weight that these games hold – physical weight and the mental weight of caring for these physical objects. My eventual “Zeal” office should have a gaming space. I never took that “videogame space” dream seriously. I like these weird little pieces of plastic. If I could spend more time cleaning, testing, and playing them, I would. They’re objects devoid of stress… mostly. These pieces of mainly gray plastic can evoke those weekday afternoons of freedom. That’s worth honoring. Otherwise, yeah, having videogame convenience is nice. Inspirations: I used to have trouble coming up with content. It might be gratuitous to write extensively about insignificant things about my life to generate content, with ideas like “and now I’m done packing my collection, guys, no, seriously, I am, great, huh…?,” I feel that if I write about things I’ve learned, these essays can help others. Photo: The fourth box of cartridges.